"The speaker binding posts are not the usual type. I insist on non-magnetic oxygen-free copper and nickel-free gold plating for unadulterated energy transmission. Even sourcing the copper requires special knowledge. In my experience, the best source is not from a pure copper mine but a copper mine adjacent to gold, platinum or silver mines with a small degree of natural amalgamation. The gold plating on our binding posts is 10uF thick. "Even though the JB3 was not originally designed for low-output tube amps and has an 87dB moderate efficiency and 6-ohm impedance, the finished product matches splendidly with tube amps as low as 5wpc. My own setup at home is built around the JB3 with our own TL66 tube monoblocks and KingRex T20." Wiring: All internal wiring in gold-plated pure solid core copper. Cabinet: MDF construction with 1mm piano gloss lacquer (in Black, White or Red and proprietary damping material. Driver: 3-inch full range driver with special resin cast waveguide and, anti-fungus treated paper whizzer cone. 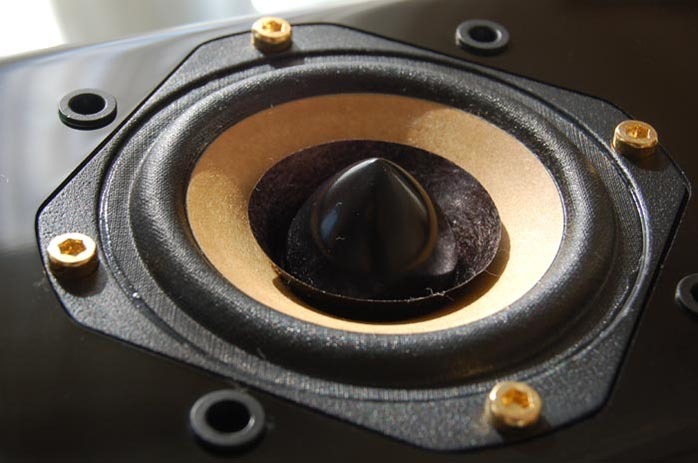 The 3" naked driver has a frequency response of 90Hz to 21kHz. When coupled to our bass reflex cabinet, it extends to 50Hz. 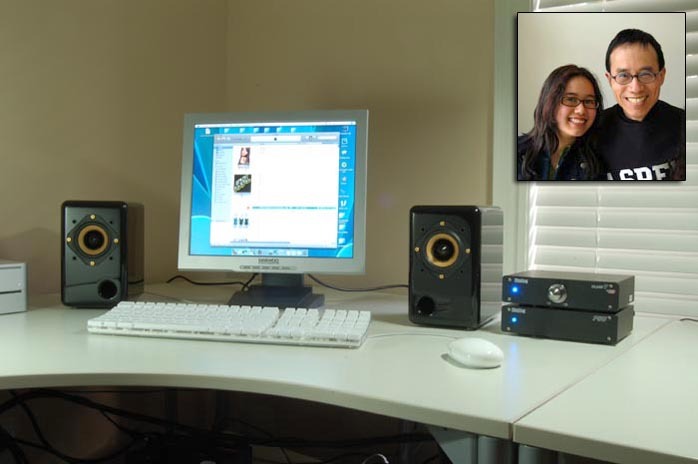 The high frequency actually approaches the realm of superior tweeters, reaching 21kHz at -1dB and 23kHz at 6dB. In terms of bass performance, we must bear in mind the physical limitation of a 3" driver. Even so, the JB3 can deliver bass extension beyond expectation if you follow these three simple rules: (1) A good solid foundation. (2) Good synergistic speaker cable. 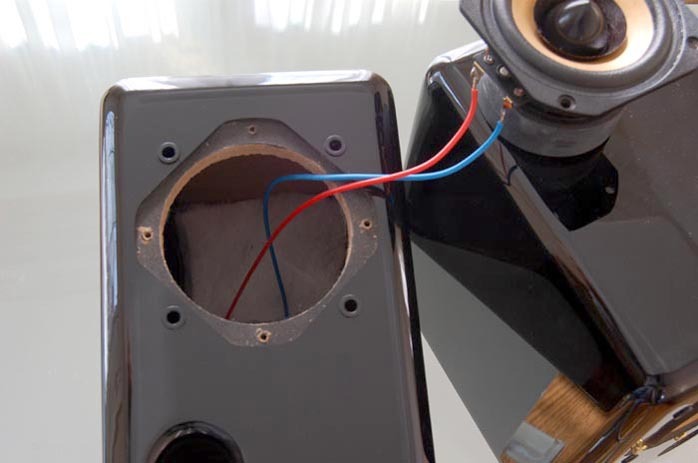 (3) Place the speakers with the bass reflex ports to the inside. The speakers should be positioned 150 - 180 cm apart, 180 - 220 cm from the imaginary middle point between the speakers to the listening position. cone. Such a recipe has long proven successful with Lowther and more recently Zu drivers but I didn't expect to see it on a tiny driver. The bullet dust cap is not just for aerodynamics but enhanced clarity. It is sometimes called a phase plug when used in multi-driver applications to reduce phase shifts. The whizzer cone -- the supplementary inner cone attached to the voice coil but without suspension -- suggests that the driver is purposely designed for producing and radiating high frequency more effectively. Some people also believe that a well-designed whizzer adds linearity and coherence to the entire spectrum. Skeptics claim that they have encountered high frequency ringing from certain whizzer cones. After removing the driver from the cabinet, the "enormous" magnet and basket assembly came into sight. Apparently Tommy has packed a lot of thinking into his tiny tot. I noticed that the spider was not only reinforced with a coating of resin but also had a few tiny round holes punched out. Another voicing tweak as confirmed by Tommy. I checked for the special internal damping materials and found that they were double-layered, the bottom one being black and foamy, the top one white, fibrous, extremely light and of low density. The MDF cabinets are constructed in mirror-imaged pairs, designed to be placed with the bass reflex ports to the inside. This obviously costs more in production and packaging time to sort out every pair but is the kind of touch that reflects a great deal about the company's philosophy and perseverance. (It's a pity that my JB3 loaners were from the first production run and thus born too early to benefit from the new slick-looking gold-plated binding posts.) Tommy suggested that the JB3 mating with the KingRex T20 or T20U would make a great system for a computer desktop. So that's where I started. Desktop rubbish: Time to clean up. It's hardly unusual for teenagers to binge upon musical adventurism. I've gone through countless miniature rebellions: In my early teens, the aimlessly enraged vocals of Linkin Park and the malevolent metal of the foreign language Rammstein; mid teens, a return to the more melodic and less jilted polished urban Brandy, meditative fusion Enigma and bittersweet alternative Sneaker Pimps; late teens, a foray into both Asian pop as well as world music. And within the past month, breakbeats and classical electro are piling up on my iTunes. Perhaps this latest rebellion is the most direct contradiction to my dad's tastes. Where his Händel was deliberately penned for the courts of kings, my Jazalou & Lockefella is motivated at the grass roots and recalibrated for the streets. My generic loyalty is time and again influenced by the attention-grabbing nature of the music market that combines quality of sound and rhythm with attitude labels such as 'independent' or 'world ethnic' to identify oneself with as an entertained cultural individual. As a result, my desktop sound system plays a colorful variety of genres over the course of a day. I have used the Minipods for a couple of years and I am now experiencing the difference with the JohnBlue JB3s. In the looks department, the Minipod is very chic and guests have never failed to notice it and comment upon its unique silhouette. The JB3 has an understated sophistication of class in its piano gloss finish. Above all, however, it is in how the JB3 realizes the quality of thoughtfully engineered tracks that it shines.